Take a look at our recent award winning wines! Fresno State’s expanded Gibson Farm Market offers a wide variety of products that are produced by students on the university’s campus. The products in-store have been either grown, packaged, and/or processed by Fresno State and its students. This unique market is the only location that unifies and showcases the products of the different enterprise units of the Fresno State University Farm Laboratory. In the market, customers will find the many products of the Crop, Dairy, Enology, Floral, Food Processing, Horticulture, Meat, Orchard, and Viticulture Departments. All of our fresh produce are picked from our fields and placed directly on our shelves. Need a great gift idea? 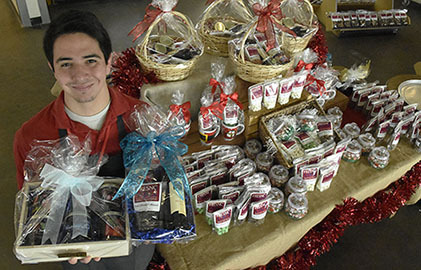 Pick up our holiday gift baskets and boxes featuring Fresno State wine, jarred or packaged candy and nut products. Customers can arrange in advance to have a custom box or basket (featuring 3-12 products) made by calling ahead. Please follow us on social-media to learn more stay up-to-date with the happenings here at the Gibson Farm Market!